LOCA / CRAZY is the only word that can best describe the 50th anniversary of the Miss Universe Pageant. Starkly contrasting from last year’s elegant edition in Cyprus, this year’s telecast proved to be a cacophony of clashing elements that was only saved by the sheer beauty of the delegates themselves but nothing more. The end of the 2-hour contest culminated in Denise Quiñones, a 20-year-old beauty from Lares, Puerto Rico, winning the coveted title on national soil in Bayamon. CAN ‘PREDETERMINED’ BE SPELLED WITHOUT ‘PR’? : The show opened with Puerto Rican pop sensation, Ricky Martin, yelling, "Puerto Rico" to a loud and patriotic audience, which kept roaring as he performed the first of two songs of the evening. In what resembled an opening to the Latin Grammy Awards, viewers had to wait until Martin finished shaking his closeted bon bon before the delegates were introduced in a pre-taped parade of nations where Miss Puerto Rico, Denise Quiñones, was the last delegate to introduce her country while wearing a feathered rooster costume. If that were not enough to rile up the home crowd even more, Miss Puerto Rico was then the last semi-finalist to be called into the Top 10. However, the most blatant example of favouritism towards the host delegate was during the oddly separated swimsuit competition, where Miss Puerto Rico was able to perform on stage in her own swimsuit segment after a commercial break. Quinones then went on to win the Bluepoint Best in Swimsuit Award, Miss Photogenic and the Clairol Herbal Essences Style Award. Quinones owned the swimsuit and the evening gown competitions by earning the highest scores in both and with two Puerto Rican judges on the panel, namely former Miss Universe from Puerto Rico, Dayanara Torres, and her sickly looking grease ball of a husband, Marc Anthony, eyebrows were raised and fingers started pointing. 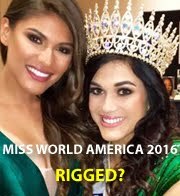 So, was the pageant rigged? A quick review of their individual scores indicates that six of the eight judges had Quiñones as their favourite while only two preferred Miss Greece, Evelina Papantoniou. Interestingly, Torres was the most lenient judge handing out the highest scores of the night and despite what fans may want to believe, she had Miss Puerto Rico and Miss Greece in a virtual tie for first place. Anthony also shared similar tastes as his wife with the exception of Miss Greece whom he did not favour whatsoever. Perhaps Papantoniou reminded him too much of Torres while Quiñones’s resemblance to Jennifer Lopez is what set his pulse racing! Adulterio caliente! The onstage battle between Quiñones and Papantoniou boiled down to beauty queen vs. model and while many believe both female personages are one in the same, they are not. Quiñones is a product of the beauty pageant factory and her appearance, catwalk and gestures were textbook for Miss Universe. 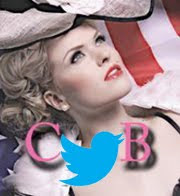 Visually, Quiñones was a more refined Brenda Liz Lopez (Miss Puerto Rico Universe 1999), which indicates that her directors learnt from past mistakes and made appropriate changes in their strategy. The end result? Quiñones looked prepared, which is far more reassuring to a judge than someone who takes the sporadic ‘joie de vivre’ route. Papantoniou, on the other hand, was a free-spirit from the world of international runway modeling. Although she did not smile nearly as much as Quiñones, Miss Greece’s moves, personality and gown were refreshing to see in a pageant and perhaps her downfall was due to the fact that she was ahead of her time. She falls into the same category as two former European Miss Universe semi-finalists from Italy, Arianna David (1994) and Denny Mendez (1997), both of whom attempted to break the stereotypical pageant mold but were unable to clinch the crown. 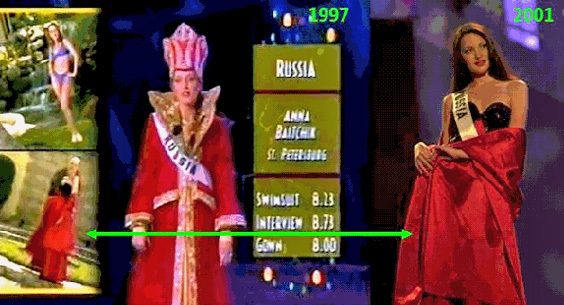 THE BIRTH OF MAINSTREAM SCANDALS: Flashback to Miss Universe 1994. Miss Venezuela, Minorka Mercado is asked what relevance do pageants such as Miss Universe have for a woman today by judge and former Miss Universe 1990, Mona Grudt. Mercado’s translated response, "I believe that the basic relevance of all of this is that we have to, through these kinds of pageants, take advantage of telecommunications…of what we have at our disposal in order to communicate with all of humanity in order to transmit a wonderful message of peace…of peace and love in order to bring the whole world together." Now, replace the words peace and love with "scandal" and "attention" and the last line of her response with "so I can get ratings and make money" to get an idea of how Miss Universe owner, Donald Trump, would respond to this question. This year, there were an unprecedented three major Miss Universe scandals, which made headlines around the world and certainly brought Trump some much needed ratings. Miss Brazil, Juliana Borges, admitted to the press that she had undergone cosmetic surgery over seventeen times before her participation at Miss Universe. The human mannequin was unapologetic about it and did not believe that natural beauty was better than the fabricated kind. Despite her openness, Borges failed to make the semi-finals. Miss Israel, Ilanit Levy, must have found superficial scandals too petty and thus took it upon herself to bring politics and pageantry together. 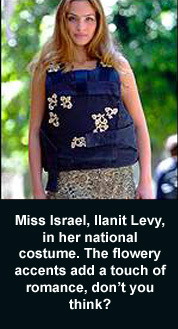 In her attempt to spread the message of peace and sisterly love throughout the universe, Levy opted to sport a bulletproof vest as part of her national costume. The Miss Universe Organization was quick to yank off the vest, just after the media noticed (how convenient!) and asked the beauty queen and former Israeli soldier to don a virginal white costume instead. Levy’s cooperation paid off, as she made Top 10 and ended the night in 8th place. However, the biggest pageant scandal of the year involved Miss France, Elodie Gossuin, who was the victim of a nasty rumour instigated by a French magazine that purported her to have been born male. Initially, Gossuin laughed off the accusations but there was no escaping the brutal bastardization MUO inflicted upon her by mentioning possible gender testing on major news outlets. The French beauty was able to keep her composure throughout the ordeal and managed to make the semi-finals, where viewers had the opportunity to gaze at her crotch during the swimsuit competition and draw their own conclusions. Yes, folks. This is the beginning of the renovated ‘Trumpified’ Miss Universe Pageant so it highly likely that this is only the tip of the scandalous iceberg in terms of what to expect in the future. REDUCE, REUSE, AND RECYCLE: Coincidentally, the first edition of the Miss Earth Pageant is to kick off in October. However, Miss Universe was also able to employ some environmental friendly aspects to their own pageant…well, figuratively at least. • This year, contestant airtime was significantly reduced as was the quality of interview answers. None of the Top 5 were able to respond to their over-used final question as eloquently and masterfully as Miss Universe 2000, Lara Dutta, from the previous year. • There was also a reduction in the collective IQs of this years hosts. How can MUO go from articulate and witty emcees such as Jack Wagner (1998-1999) and Sinbad (2000) to Hooked on Phonics supermodels Elle Macpherson and Naomi Campbell? A pair of chimps on roller-skates would have been more entertaining and easier to follow. • Finally, what’s the best way to reduce one’s chances of scoring well at Miss Universe? Reduce the movement in one’s left arm of course! Miss France brought new meaning to the phrase "stiff competition" and this is not reference to her gender! Her left arm was solid as a board and motionless all night. Gossuin claimed that the media assaults on her had taken such a toll that she acquired a spasm in her left shoulder. • Both Miss USA, Kandace Krueger, and Miss Venezuela, Eva Ekvall, decided to wear gowns that they had previously used in their competitive pasts during the Miss Universe live telecast. Krueger opted for the metallic silver and grey gown she won Miss Texas USA in while Ekvall tried to keep her victorious streak unblemished by wearing the white and taupe dress she wore when she won Miss Venezuela. • Miss France, Elodie Gossuin also found inspiration in the past as she emulated the evening gown look of former Miss France 1996, Laure Belleville, who nearly missed the semi-finals in her year by placing 11th. Gossuin reused the same gown design, hairstyle, jewellery and accessories for her own look. Perhaps the stiff left arm was an inspiration as well! See for yourselves! • It is also important to note that Oxana Fedorova (Miss Russia) was invited to compete at this year's pageant but declined in order to finish her degree. However, not wanting to let an exquisite beauty slip through their hands, MUO decided to reissue their request in 2002 where Fedorova won the title only to be replaced by her 1st runner-up, Panama’s Justine Pasek. • In a purely odd and embarrassing turn of events, Miss Russia, Oksana Kalandyrets, decided to recycle the evening gown worn by her Miss Russia Universe predecessor from 1997, Anna Baitchik. The red satin gown with black sequined bustier looked vampirish and it begs the question, was this the ONLY gown option Kalandyrets had? One can only hope the dress was fully disinfected after it had been lifted from the trash can! and Miss Russia 2001, Oksana Kalandyrets. ICONS: No other edition in Miss Universe history thus far has featured so many present and future beauty pageant icons. As this was Miss Universe’s 50th anniversary, MUO invited former titleholders including Finland’s Anne-Marie Pohtamo (Miss Universe 1975), Puerto Rico’s Deborah Carthy-Deu (Miss Universe 1985), Mexico’s Lupita Jones (Miss Universe 1991) and two winners from Venezuela, Irene Saez (Miss Universe 1981) and Barbara Palacios (Miss Universe 1986). They were all interviewed backstage and tried to one up each other when explaining how happy they were to be present. Perhaps being in front of a microphone brought back their competitive spirits or perhaps they really dislike each other. Miss Universe 1997, Brook Lee, also served as special announcer. 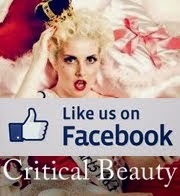 But no one expected there to be two future major beauty titleholders in the mix during the live telecast. All was not lost for two semi-finalists. Miss Nigeria, Agbani Darego went on to win the title of Miss World 2001 and Miss France, Elodie Gossuin, cruised her way to victory at Miss Europe 2001. Finally, pageant fans and message board users were so captivated by Miss Greece, Evelina Papantoniou’s catwalk that they immortalized her seductive skill on the runway by dubbing it ‘The Evelina Walk’. She was certainly the most loved contestant this year but had she defeated Quiñones in the Top 2, all hell would have broken loose inside the Coliseo Rubén Rodríguez Theater with the sole survivor having been Miss Israel thanks to her bulletproof vest!